This is one I recently got from the library... though it is one I have seen before. I believe I first caught this on cable.... but it could have been netflix. I enjoyed this one quite a bit. Not surprising... as I been a fan of Katherine Heigl for some time now. This is one I hope to add to my collection before too long. Inspired by the perennial bestseller, WHAT TO EXPECT WHEN YOU'RE EXPECTING is a hilarious and heartfelt comedy about five couples whose intertwined lives are turned upside down by the challenges of impending parenthood. The movie features "lots of loughs, heart, and a terrific ensemble of actors at their best" (Pete Hammond, Boxofice Magazine) and is "a must see!" (Gayle King, O Magazine). The film stars Cameron Diaz, Jennifer Lopez, Elizabeth Banks, Chace Crawford, Brooklyn Decker, Anna Kendrick, Matthew Morrison, Dennis Quad, Chris Rock, Rodrigo Santoro, Ben Falcone and Joe Manganiello. This is another film I grabbed off the shelves of the library. To be honest not sure why I even grabbed it up when I saw it. It was on the shelf where they keep all the recent arrivals... and I just grabbed it without even thinking about it... and carried it around with me while looking. I guessed I was thinking it would be a decent back-up and I just never found anything else better to replace it with. This one I found that was a laugh out loud type of funny comedy.... though there is a couple spots that is. Over-all I found that once I got into the story (which was a little difficult for me at first) that I enjoyed it quite a bit. I hope to add it to my collection soon. This is another one I borrowed from the library. The actor playing Dylan Dog is Brandon Routh who I know as the latest to play the live action Superman. But his buddy also looked very familiar to me. When I checked it turned out that it was the guy that plays the werewolf in the US version of Being Human. This film is listed as horror and comedy. While I do see this... it is more of a lightheartedness then a laugh out loud type of comedy. The movie itself is pretty good. I can see adding it to my collection eventually. Though I don't think I will be in much of a hurry to do so. When sad-sack loser Frank (Rainn Wilson, The Office), a short-order cook, sees his ex-addict wife (Liv Tyler, The Lord of the Rings) willingly snatched away by a seductive drug dealer (Kevin Bacon), he finds himself bereft and unable to cope. But he decides to fight back under the guise of a do-it-yourself superhero called Crimson Bolt. With a red hand-made suit, a wrench, a crazed sidekick named Boltie (Ellen Page, Juno) - and absolutely nothing in the way of superpowers - Crimson Bolt beats his way through the mean streets of crime in hopes of saving his wife. This is one that I got from the library... it is one I have been curious about every since it was originally released. I have to say... it was different then I was expecting. I didn't hate it... but I wasn't thrilled with it either. The weird thing about it is that I can't really pinpoint what it was about this film that I liked and what it was about this film that I didn't care for. I can say that I never been much of a fain of Rainn Wilson... but I don't really think that was the problem here. I think part of the problem was the characters was a little too much over the top for my taste. Ellen Page scores huge laughs as Bliss Cavendar a small-town teenager with a big dream: to find her own path in the world. Soon Bliss discovers a way to put her lifw on the fast track...literally. She lands a spot on a rough-and-tumble roller derby team and becomes "Babe Ruthless" - the hottest thing on eight wheels. This is one of the ones I borrowed from the library. I mainly grabbed it because of Drew Barrymore. Not only does she have a (fairly small) part in... she is also the director. And I been a fan of hers for quite a while now. The main star here is Ellen Page. Someone that I really am not that familiar with... but I have enjoyed in the few things I have seen her in. This is a pretty good film. I enjoyed it.... but it is one that I don't see myself watching all that often. I can see myself adding this one to my collection at some point if I find a good deal on it. But now that I seen it the once... it isn't something I will be going out of my way to look for. This is one of the ones I borrowed from the library. I mainly wanted to see this one because Kevin James is in it. And I have liked him since first seeing him on King of Queens. This is a fun film. I enjoyed it quite a bit. And it has a lot of famous people doing voices of animals... Nick Nolte (gorilla)... Adam Sandler (monkey)... Sylvester Stallone (lion)... Cher (lioness). This is one I can see adding to my collection. Definitely worth the time put in to watch it. Andy Stitzer (Steve Carell) has gone 40 years without "doing it." Now his pals are making it their mission to help him score... fast! Can he survive their hilariously bad advice? Will he land in the arms of the way-too-experienced or the way-too-drunk? Or can he find true love where he least expects – from a gorgeous grandmother (Catherine Keener)? With additional footage too bold for theaters, The 40-Year-Old Virgin now packs even more outrageous comedy! \This is one that a friend sent me recently. I never seen it before now... but I found I enjoyed it very much. It is just a lot of fun to watch. Though I could have done without the little musical scene at the end. I got a kick out of seeing Kat Dennings (2 Broke Girls) playing the teenage daughter of his girlfriend. I have been a fan of hers since the pilot episode of her show. Anyway if you never had the chance to check this one out I definitely recommend it. Say "I do" to this hilarious "mockumentary" about a trio of wacky couples who vow to win the coveted title of "Most Original Wedding of the Year." The dueling duos include the tuneless Matt (Martin Freeman) and Sam (Jessica Stevenson) whose unfortunate wedding theme is Hollywood musicals; the hypercompetitive tennis partners Josef (Steven Mangan) and Isabelle (Meredith MacNeill), and the outrageously uninhibited nudists Michael (Robert Webb) and Joanna (Olivia Colman). At stake is a million-dollar dream home, but can love survive in the midst of unbridled prenuptial chaos? 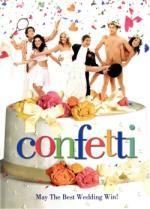 Featuring a talented cast and three alternate endings that let YOU choose the winner, CONFETTI will "keep you laughing from start to finish" (Empire). This is one of the many that was given to me over the years. This particular one has been sitting in my unwatched pile for about two years now. It is one I never even heard of before getting it... let alone seen before today. Going by the overview I really wasn't expecting too much from this one. But I must admit it was better then I was expecting. I still wouldn't say it is a great movie... but I did find I enjoyed it. Even if I did call the winner of the contest at the beginning of the film. But over-all it is worth the time put in to watch it. When Denny Colt, detective for the Central City Police Department, survives an assassination attempt by criminals, he is still believed by the public to be dead. He decides to use to his advantage, since being "dead", he isn't subject to the rules that bind regular cops. To this end, he equips an abandoned tomb in a graveyard into a residence and headquarters and prepares for a new career. With that, he becomes the Spirit, a mysterious crime fighter whose only costume is a blue business suit, fedora hat and a little eye mask. His first major case pits him against P'Gell, a femme fatal who has criminal designs on the city. This is a 1987 TV movie that a friend sent me a copy of. It is off of an old TV recording from when it originally aired. With that being the case I was a little concerned what the quality would be like. Turns out I didn't need to worry. While it was an obvious old recording... it is more then watchable. And something that was an extra bonus to me personally.... he didn't edit out the original run commercials. And I found it oddly fun seeing the commercials that I haven't seen in a good 25 years! It brought back a lot of memories. The film itself I found to be rather entertaining... well in a cheesy sort of way. 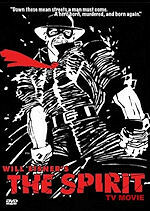 The film makes more then one reference to the character (The Spirit) being similar to The Lone Ranger... and I can see their point. What with the similar look to the mask and the fact that Denny Colt is believed to be dead. But with such a cheesy feel to it... it also reminded me a bit of the old '60s Batman series. Speaking of which... I don't know if this TV Movie was supposed to be the start of a TV series that never happened or not... but I believe I would have watched the series if they made it. Now I want to once again thank the friend of mine for sending me this one. I really did enjoy watching it.... definitely worth the time put in to it. Thanks 'Cat! When down-on-her-luck country girl Shirlee Kenyon (Dolly Parton – Steel Magnolias) walks through the wrong door at the right time, she accidentally becomes Chicago's newest talk radio celebrity and turns the Windy City's hottest radio station upside down! With her homespun wit and down-home advice, Shirlee immediately wins listeners' hearts – but causes hilarious confusion for her ratings-conscious boss (Griffin Dunne – My Girl) and comical havoc for the investigative reporter (James Woods – The Hard Way) trying to uncover her mysterious past! If you're looking for no-nonsense advice on what hit movie offers you pure entertainment – you'll love every comical minute of Straight Talk! I felt like some mild... lighthearted comedy next. So I picked this one out from my unwatched pile. Which also happens to be a gift from a friend of mine. This one is an enjoyable little film. I am not surprised it was in there... but I personally could have done with a bit less of Dolly Parton singing through-out the film. But I am sure her fans love it. If you decide to check this one out... just go into it not expecting a whole lot. I think it is enjoyable... but nothing really all that special. Worth watching on a boring lazy day. Though not a top choice. I don't think we ever have to worry about Dolly Parton getting an academy award But it is an easy watch while something else is happening. And she was fun in "9 to 5". Another film fun to watch without guilt. 9 to 5 is fun..I watched that again not long ago. This may surprise some of you... but this is the first time I ever seen this film. 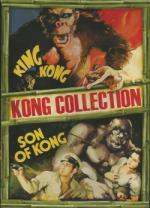 I have seen both remakes... but never seen the original before today! Something I am glad I finally rectified. Thanks to a good, generous friend that got me a copy after finding out I never seen it before. I must say... I am surprised just how much I enjoyed this one. I definitely prefer it compared to either of the remakes. For such an old film it holds up beautifully. The look of Kong was a lot better then I was expecting considering the age of the film. I must say... I enjoyed every moment of it... one I definitely recommend! And a big Thank You! to my generous friend for sending me this set!